A Christmas Story wasn't successful when it was first released in 1983, but it became a classic years later after TBS started airing it as a 24 hr marathon on Christmas Eve. The movie is narrated by an adult Ralphie, and it is seen through the eyes of a child. Even the parents don't have real names. They are simply "Mother" and "The Old Man." 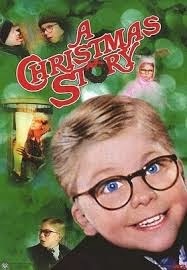 In the movie, Ralphie wants only one thing for Christmas: a Red Ryder carbine action 200 shot range model air rifle. Yet when an adult hears of his desire, they only give him one response: "You'll shoot your eye out." How does a kid argue with that logic? Ralphie spends the weeks leading up to Christmas trying to outmaneuver his mom and other adults. He also has to deal with school bullies, a little brother, and the war between his parents over the Leg Lamp. I think this movie has become a Christmas classic, because it speaks to the child in all of us. It takes us back to a time as children when Christmas was magical. Not only Christmas, it takes us back to the magic of childhood. There are so many memorable scenes in the movie: Flick's tongue sticking to the telephone pole. Ralphie visiting Santa. Ralphie saying The Mother of All Swear Words. Hearing Schwartz being punished over the phone. The ending to the Battle of the Leg Lamp. The Easter Bunny costume. This is a funny movie that kids and adults can enjoy together. So this Christmas watch "A Christmas Story" and visit a time in life when you receive that one special gift and all is right with the world. Funny reading through these and realizing how many Christmas movies didn't quite "stick" with audiences when they first came out--I guess that's what happens when you only have one chance in the year to make it happen! Great write up! This is a film I have yet to see, but I remember reading several good things about it. I agree with the previous commenter, it's interesting how many classics (Christmas classics or not) weren't succesul at first. Not a year goes by when I don't watch this movie, I love it so much. It's so much fun to watch it with mom too..that scene when Ralphie's brother is dressed like the Michelin Man just to go to school....my mom yells, "OH MY GOD THAT'S ME!" as her mother did that to her when she was a little girl growing up in Brooklyn. 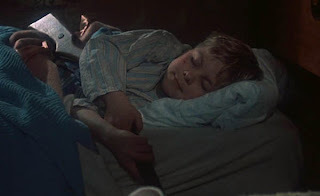 So much of that movie hits home like Ralphie getting his mouth washed out with soap. For him it was Lifebuoy for me it was Irish Spring. Then there's his father fixing that furnace and that just reminds me of my dad. The whole "you'll shoot your eye out" is just a classic line parents have been telling their kids since the beginning of time. That movie brings out the Ralphie in all of us! I saw "A Christmas Story" at the theatre upon its release. It was there and then it was gone. Gosh, I liked that cute little movie. I wondered if I'd ever see it again. Now my 23 year old daughter makes all her friends watch it. There are timeless lines that you look forward to hearing each time and always bring a chuckle. This movie is complete unknown to me. I had never heard about it until a conversation on twitter. I liked to read your comment about it. Did the hero get the present? Thanks for reminding me about this movie, I'm planning a re-watch over Christmas!